Superb. I give 4 1/2 stars to the original recipe since it calls for 50/50 white & brown sugar. Since then, I've used ALL brown sugar and increased the salt to 2/3 teaspoons, and it was PERFECT. The flavor was a lot richer. I've tried 4 recipes from this site and I'm glad I finally found my Master recipe. Some of the other recipes on this site calls for pudding mix in the batter - which baffles me. 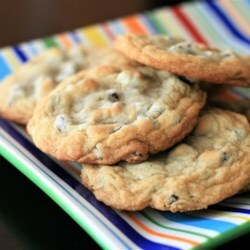 This is an excellent cookie (soft and chewy) that has only good old-fashioned ingredients. Most importantly, it stays chewy, not hard. Look no further folks, this is the one. (For walnut sized dough balls, and I did roll them for a more uniform look, 11-12 min. was perfect. 10 min. was still a little doughy). TIP - if your cookies sit around for a few days (if that's possible) and gets a little dry, put a fresh slice of sandwich bread in the same container as the cookies and they will moisten right up.